I’m going through a major “nesting” phase and my husband is going to smother me in my sleep (j/k) …. but for real, though…he’s so annoyed, despite the smile he keeps plastered on his face. I don’t know what to say, I just feel like there is so much to do to prepare. We decided to move baby into the guest room, leaving the kids’ rooms upstairs where they are. 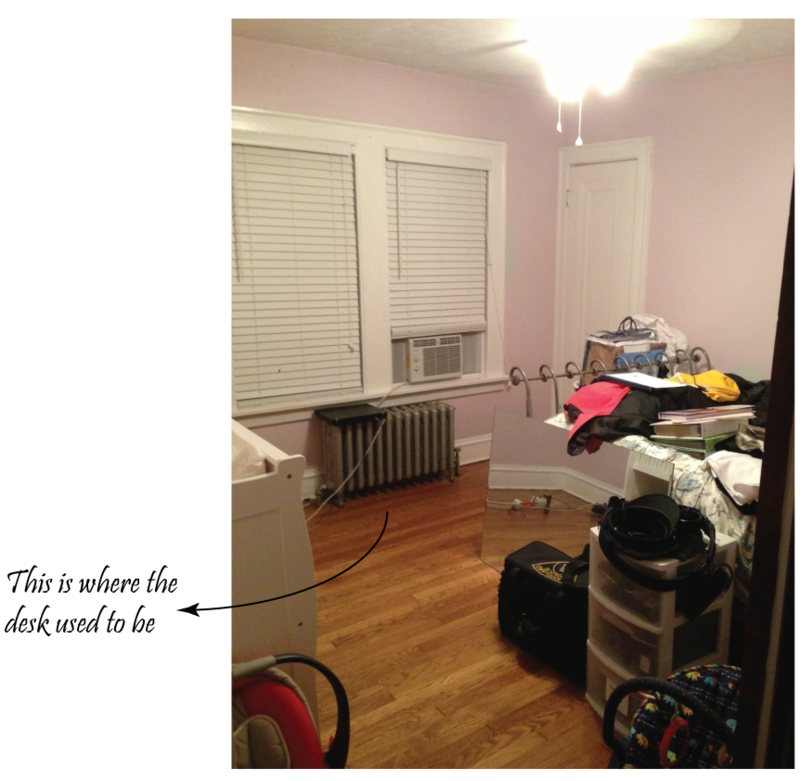 Space wise, we wanted the room upstairs for the master bedroom because of the walk-in closet and extra sq. footage, but the kids felt like they would be losing their personal space because of baby…so, we’ll keep things simple for their sake. Right now we are working on moving out furniture to make room for baby, which is proving to be difficult since we don’t know where to put anything. 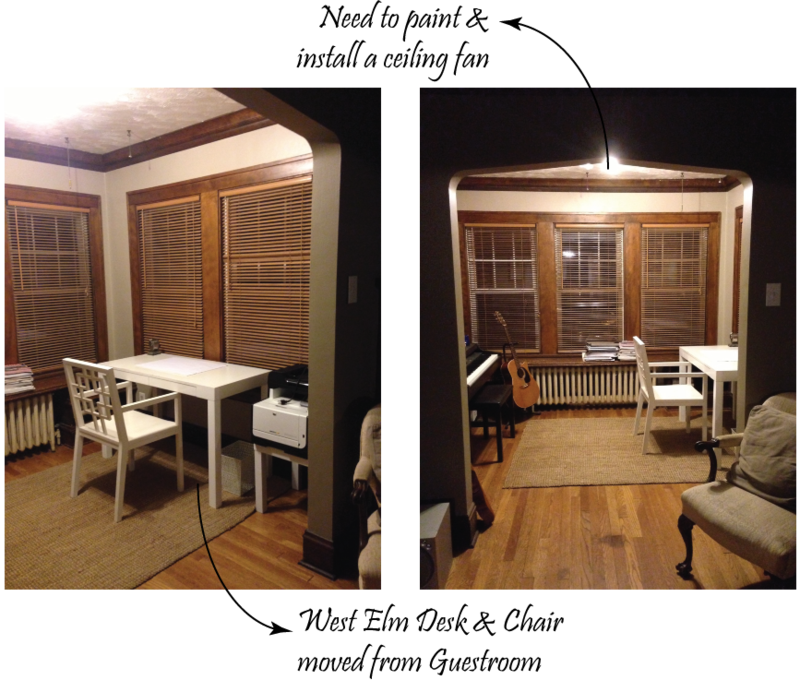 We started by moving the desk and extra-large printer (a gift from hubby) to our front sunroom. I have to admit, it’s kind of a great place for an office- minus the musical instruments on the opposite wall. Before baby, we’ll need to paint the walls and trim as well as install a ceiling fan. In a perfect world, we’d like to add french doors to provide some privacy…but who knows when that will happen. With the desk out, we now have an empty space in front of the radiator/window area. Gotta be honest, not sure that we’ll put anything in it’s place…maybe mini shelves on either side at some point, but for now, I’m good with it as is (husband is happy about that). That leaves us with three remaining walls. We still need to move out the full-sized bed, but we’re not sure where to put this yet. We may move it to the master bedroom in place of the King-sized bed that exists there now, but then we still have the issue of having an extra bed to store away…We need one wall for the crib, one wall for the changing table and, since the closet in this room will remain our “office” storage, we’ll also need one wall for a dresser of some sort for babies’ clothes. We are thinking about putting the crib on Wall 2, the changing table opposite the crib on Wall 3 and use wall 1 for a Dresser and Rocking Chair setup. This might change based on spacing so, standby. Crib- Mom is giving us my crib from when I was a baby. Changing table- We bought one on Craigslist for $60 (Craigslist makes me nervous, but we really lucked out). Crib Bedding- We decided to go with a bedding set from Babys-R-Us (the only one my husband liked out of all of my amazing choices, go figure). Previous Post It’s A Boy! Blue Nursery Bedding.